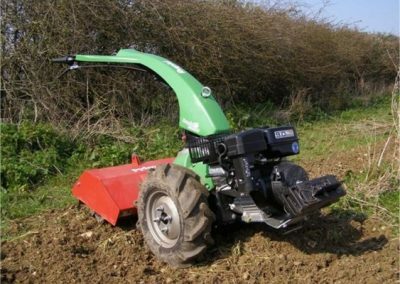 The Rapid Mondo features a 9hp petrol engine, hydrostatic transmission and a totally independent PTO system. A tool free quick attach change system allows for many different attachments. The Mondo has no awkward transmission clutches or difficult gears to find but just the familiar Rapid twist grip control giving progressive forward and reverse travel. 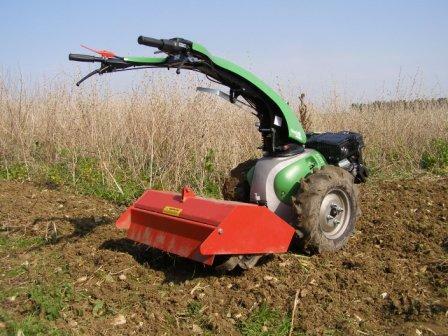 The handlebars are easily adjusted to suit the operator’s height keeping the machine comfortable to use. This versatile tractor is suitable for use where space is limited, maybe accessing gardens for landscapers or smallholders through to large open spaces where a lightweight tractor is required in wet lands such as reed beds. 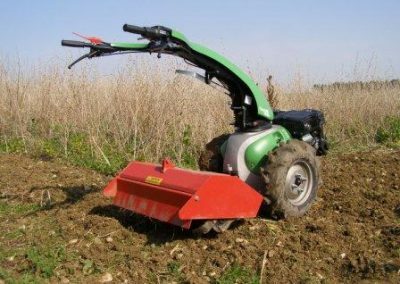 When used with the correct wheel type, such as dual or cage wheels, then the Mondo can be used on steep ground for operations such a grass cutting or alternatively with the single wheels set narrow, it’s ideal for jobs such as rotavating. It’s able to perform all these tasks thanks to its ability to work in two directions. The handlebars simply rotate, allowing the drive wheels to be either behind the attachment for jobs such as mowing or in front of the attachment for cultivation jobs. Whichever way the handlebars are, the controls remain the same making the Mondo a safe and easy tractor to operate.